This adapter allows you to connect your bnoculars to your tripod. It comes highly recommended when using larger binoculars such as the Meade Astro Binoculars due to the size and weight of the bnoculars as they dont lend themselves to prolonged use. 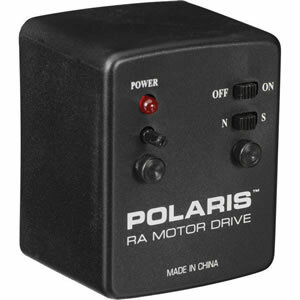 Meade Polaris DC Motor Drive for Polaris series Equatorial Telescopes. Battery / Runtime 1 x 9 V battery / 40 h max. 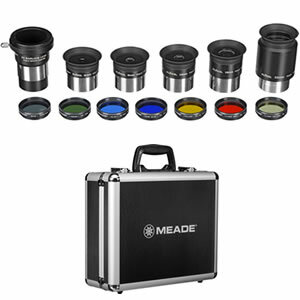 The Meade Series 4000 1.25" Plossl Eyepiece & Filter Set gives you five anti-reflection multicoated eyepieces with focal lengths from 6mm to 32mm for a wide-range of magnifications. Each eyepiece has standard filter threads and fold-down eyecups. A 2x Barlow lens doubles the magnification potential of the eyepieces adding even more versatility. Complementing the eyepieces are six colored filters for planetary and Lunar viewing. 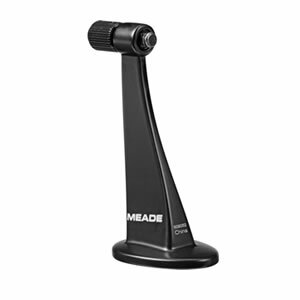 These are the most common and useful that Meade make, including an ND96 Moon filter. The filter housings are anodized aluminum and the filters themselves are optical glass. To safely carry and store the eyepieces, Barlow, and filters a hard aluminum case is included. The case has reinforced edges and corners with a sturdy hinged handle and dual lockable draw latches. The interior has egg-crate foam on the lid, and custom-cut foam for all the set components. There is also three pre-cut spaces for user-supplied eyepiece.